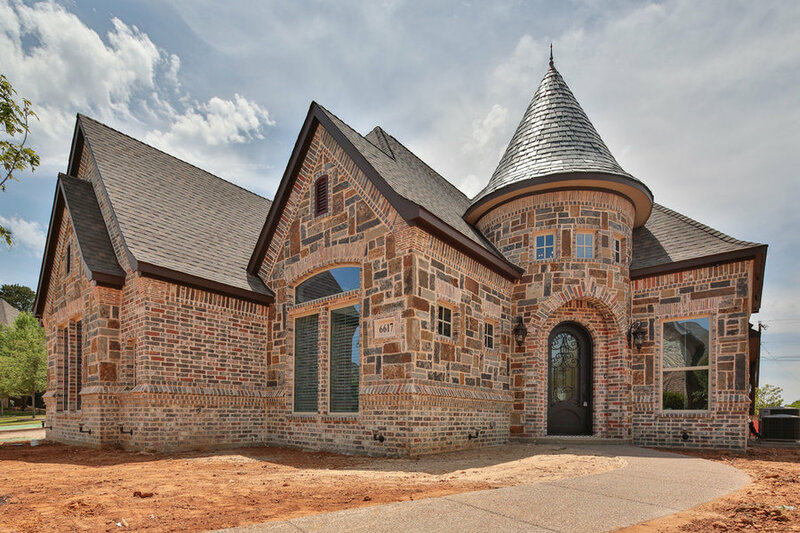 Old world designed custom home with brick & stone details. 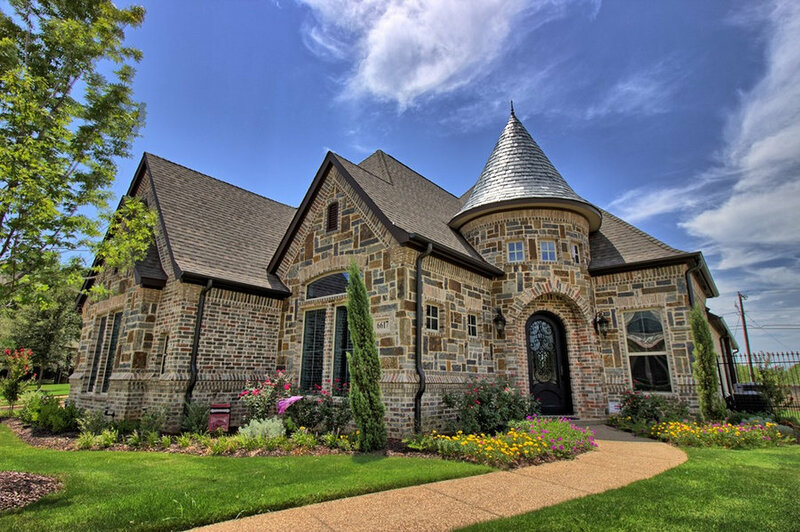 Turret roof done with Vermont slate tile. 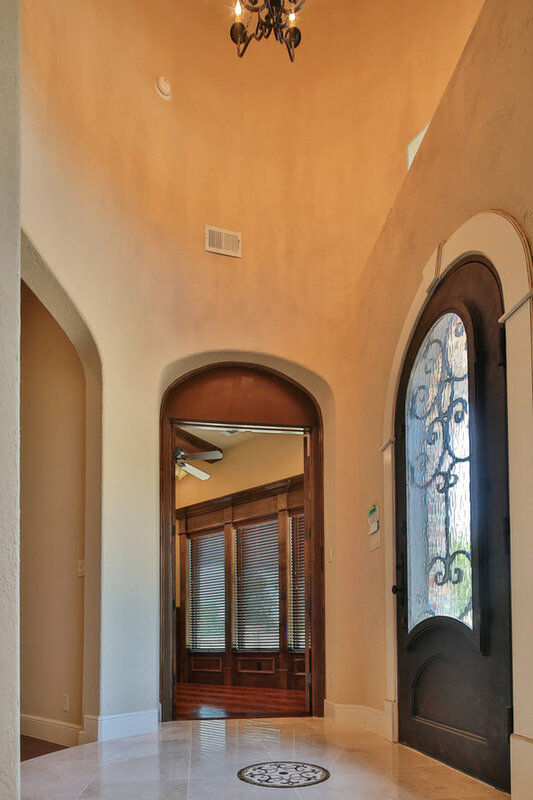 Round top custom iron & glass door. 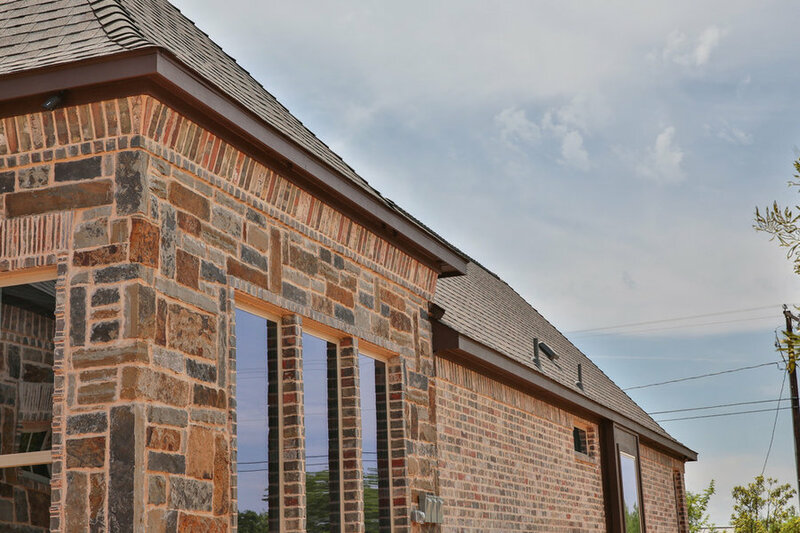 Slanted brick at top moulding. 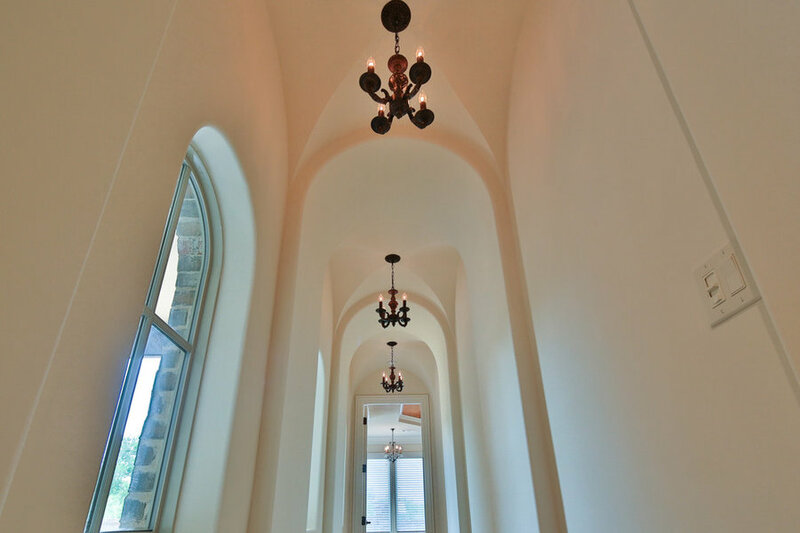 Entry from the front door detailed with elliptical arches opening to the study, living room, and dining room. 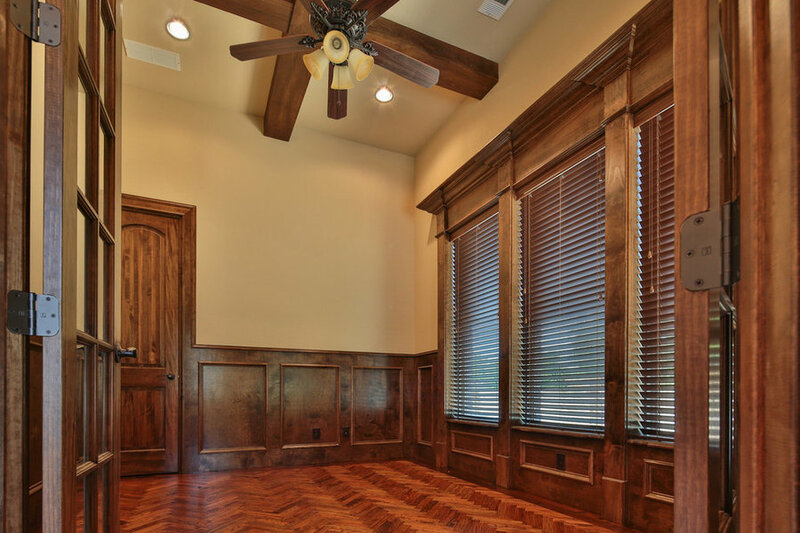 Study from the entry with detailed Harringbone hand-scraped red oak wood floors with a dark walnut border, beautiful wood ceiling beams, and wood window detail. 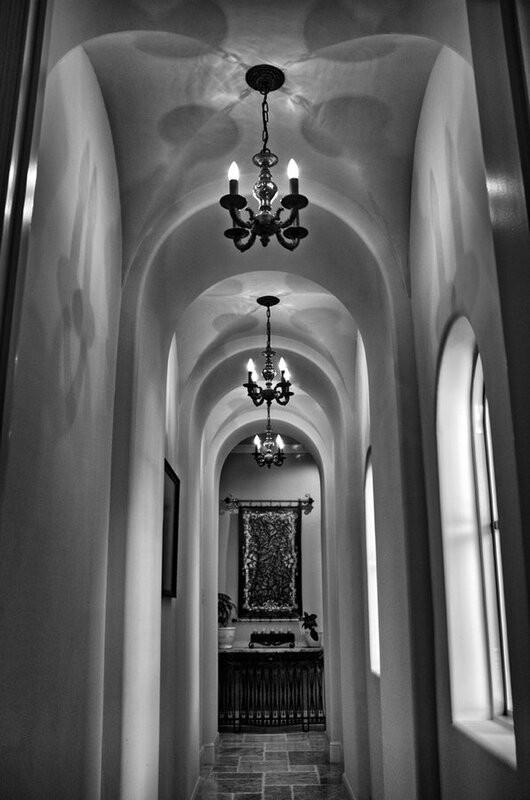 View from inside the study. 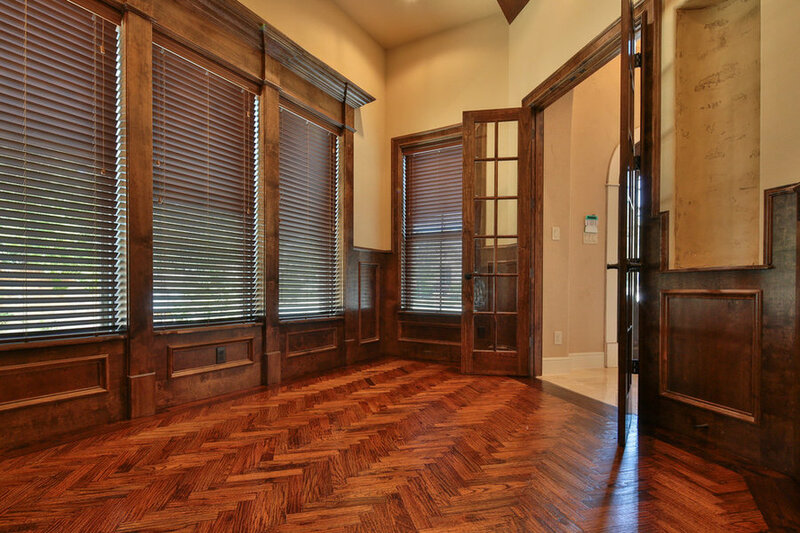 Hand-scraped red oak floors with a dark walnut border and twin doors that open into the entry. Wood detail around windows. 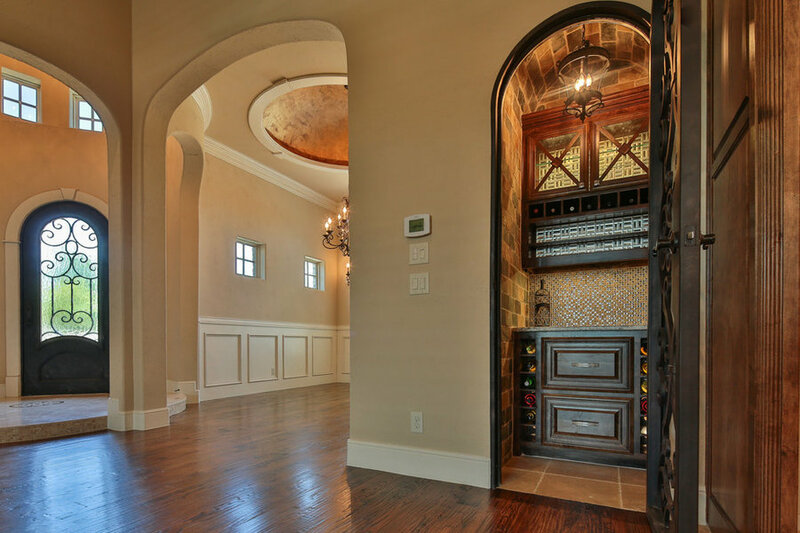 Custom wine grotto with stone tile and elegant iron gate. 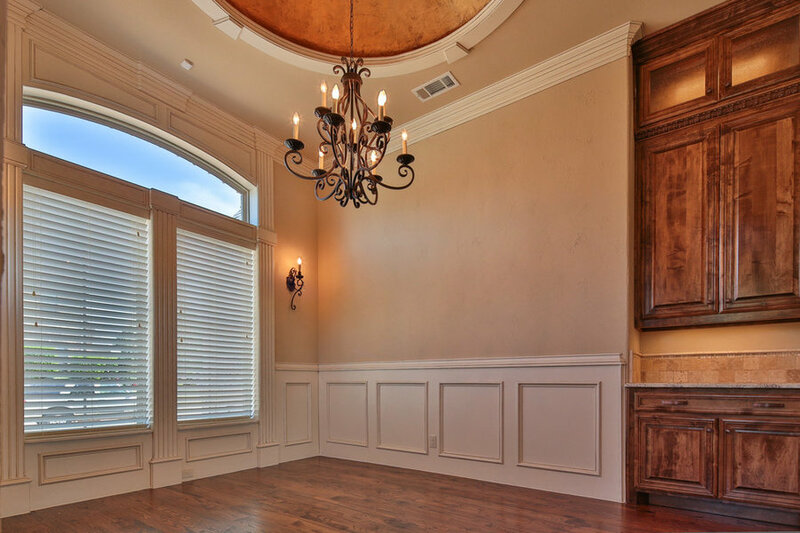 Formal dining room open to the living room and kitchen with beautiful hand-scraped hardwood floors. 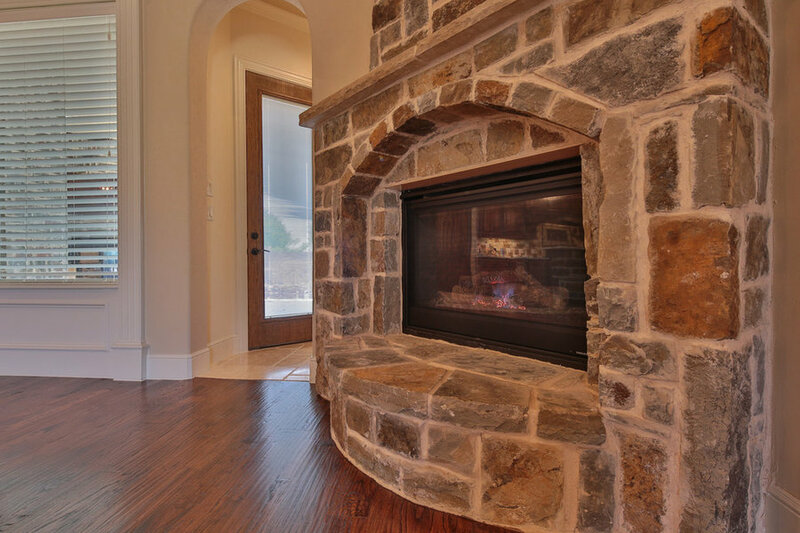 Rustic fireplace in living room with stone detail. 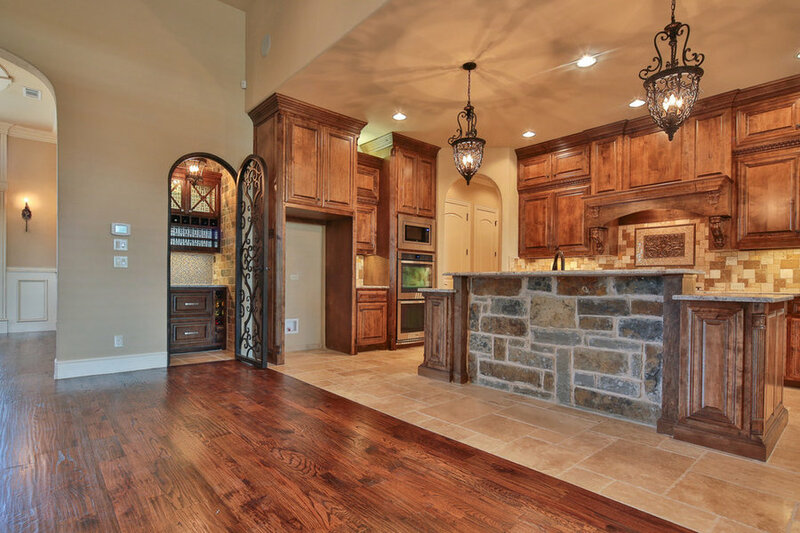 Open kitchen with chiseled edge travertine tile floors, wood cabinets, stone detailing on center island, and twin iron light fixtures. 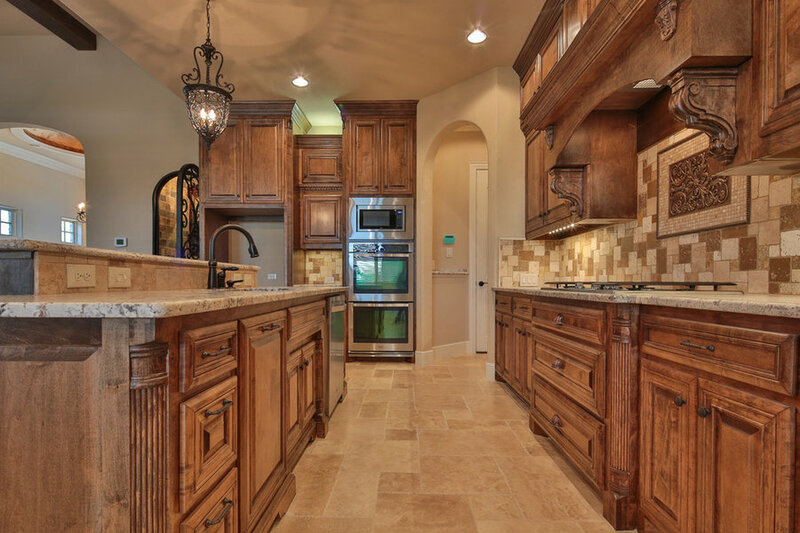 Large kitchen with center island has wood cabinets, granite counter-tops, and chiseled edge travertine floors. 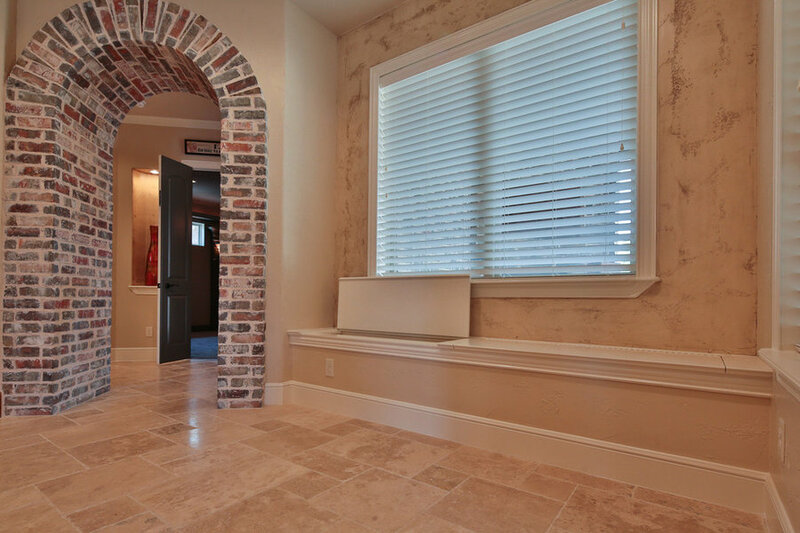 Stone and tile detailed back splash. 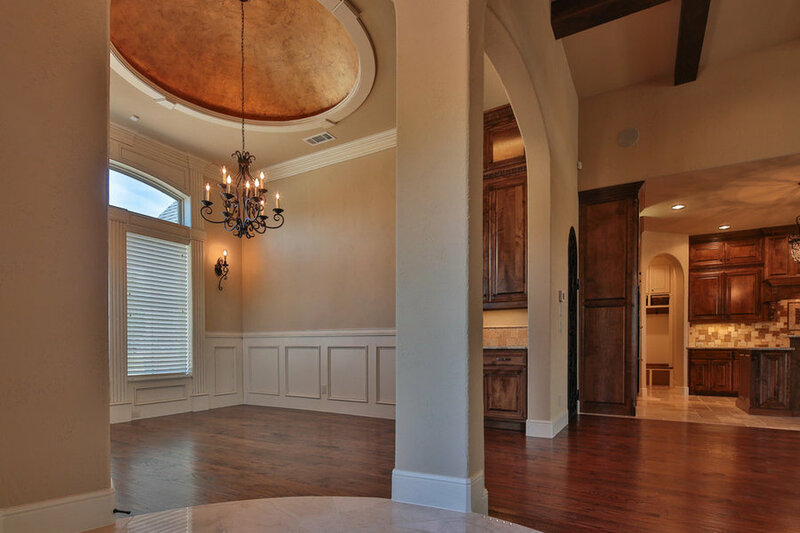 Grand kitchen opens to living room. 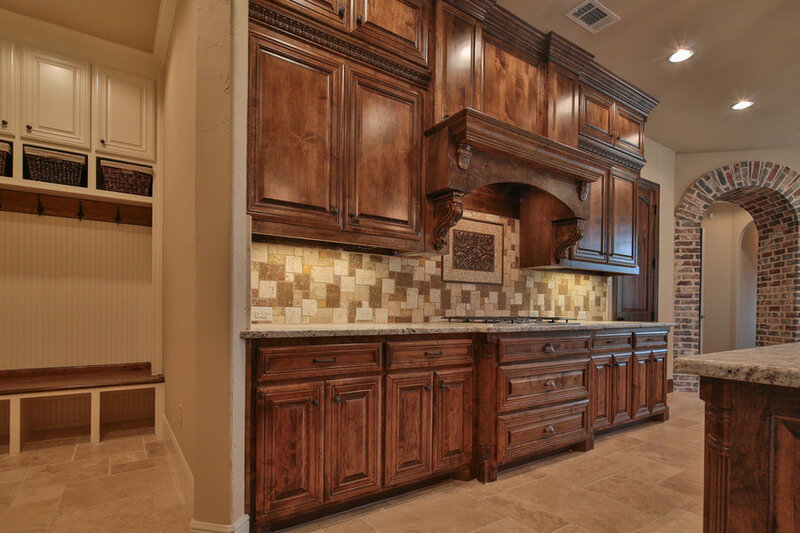 Beautiful chiseled edge travertine tile floors, granite counter tops, and wood cabinets complete with stainless steel appliances. Cozy breakfast nook off of kitchen and living room. Built in bench with storage and a glazed wall finish. Mud room leading to garage and just off the kitchen. Antique wood detail cabinets and storage area. 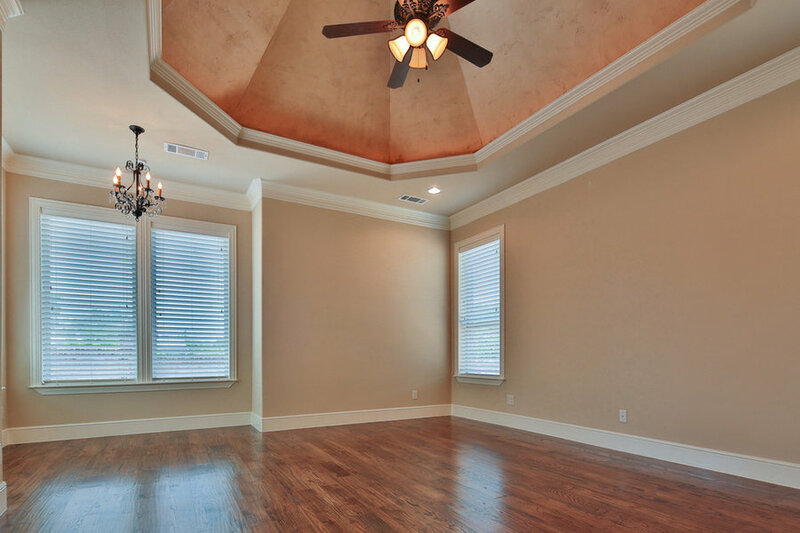 Beautiful master bedroom with hardwood floors, a reading nook, and emerald cut ceiling with glazed gold finish. 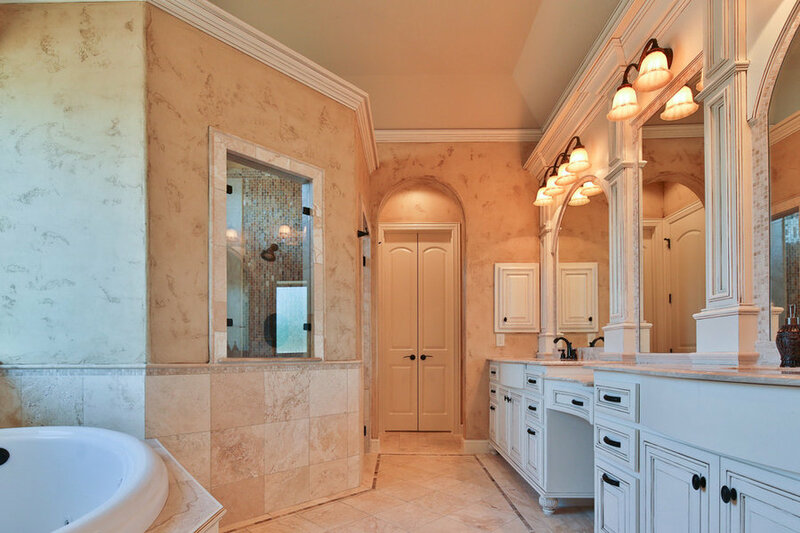 Luxurious master bathroom with travertine tile floors, walk-in shower, bathtub, wood cabinets with antique finish and detail. Walls finished with glaze. 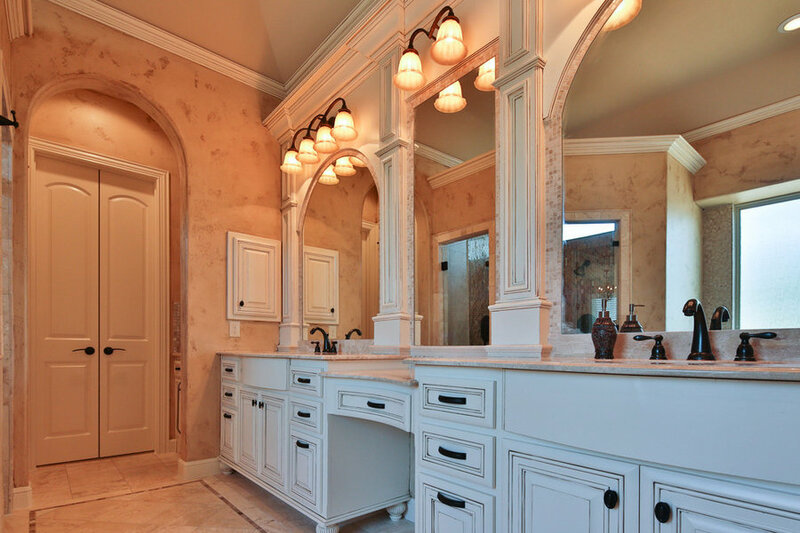 Antique finish on wood cabinets in master bathroom with granite counter tops and travertine floors. Twin doors lead to master closet. 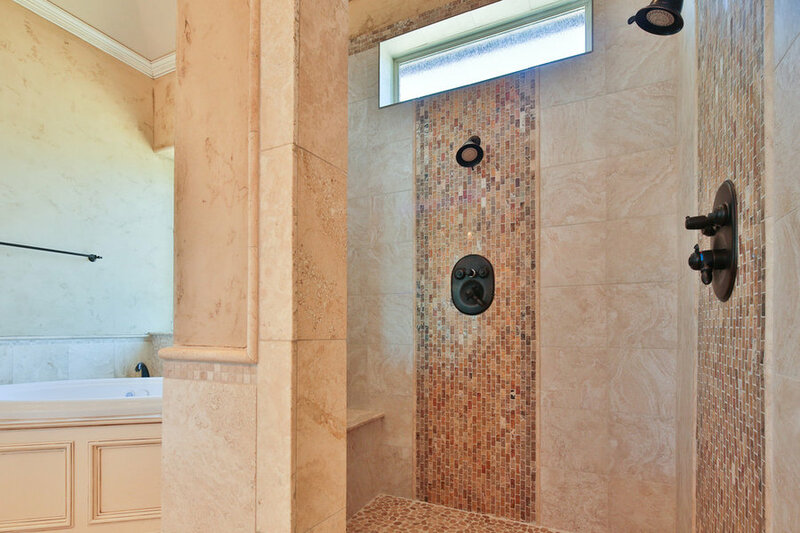 Large walk-in shower with tile detail, double shower head, and resting bench. Detail of antique finish on wood cabinets. 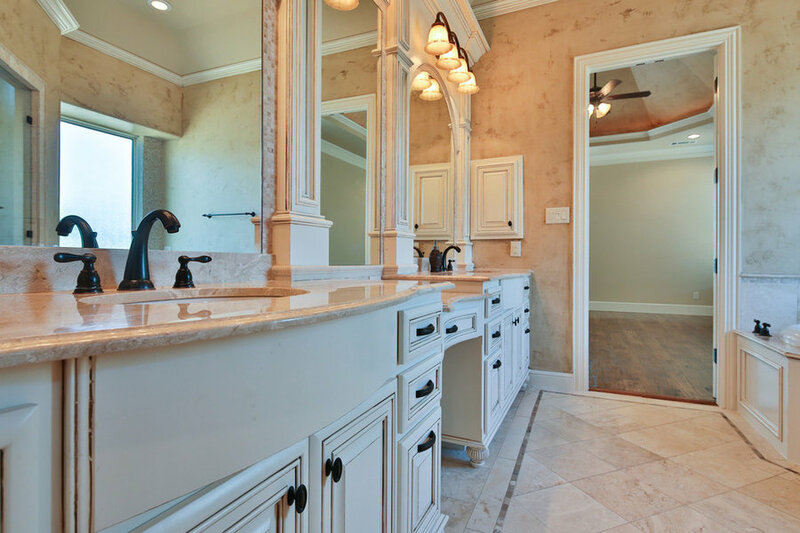 Granite countertops with vanity space between the sinks. 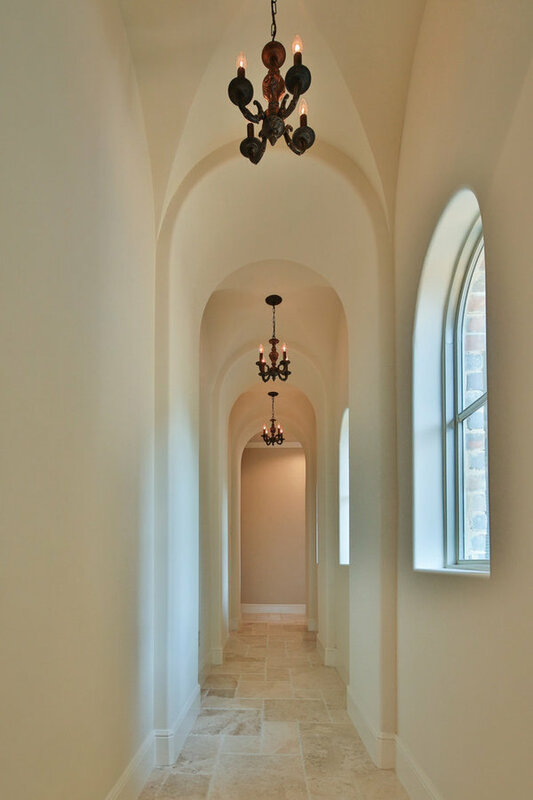 Hallway leading to master bedroom with chiseled edge travertine floors, groin vaulted ceiling, iron light fixtures, and windows looking out into the backyard. 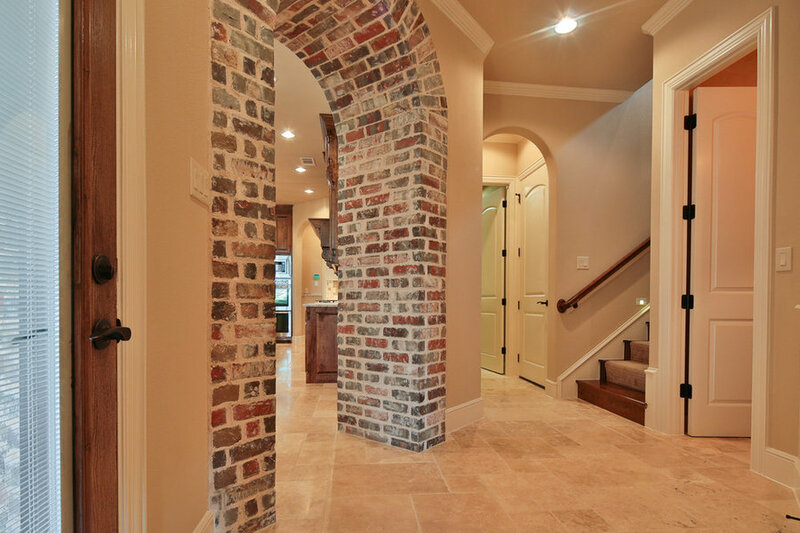 Wonderful brick arch creates a threshold off the kitchen leading to laundry room, upstairs, powder room, media room, and downstairs guest bedroom. 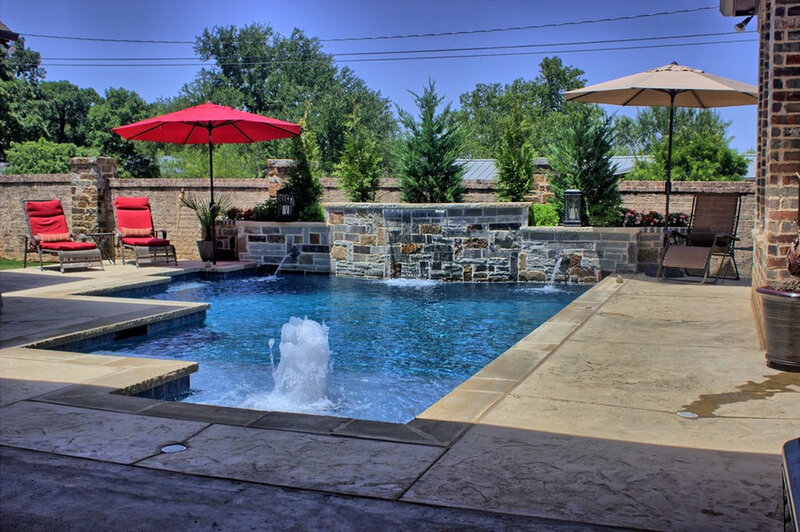 Chiseled edge travertine floor continues through the space. 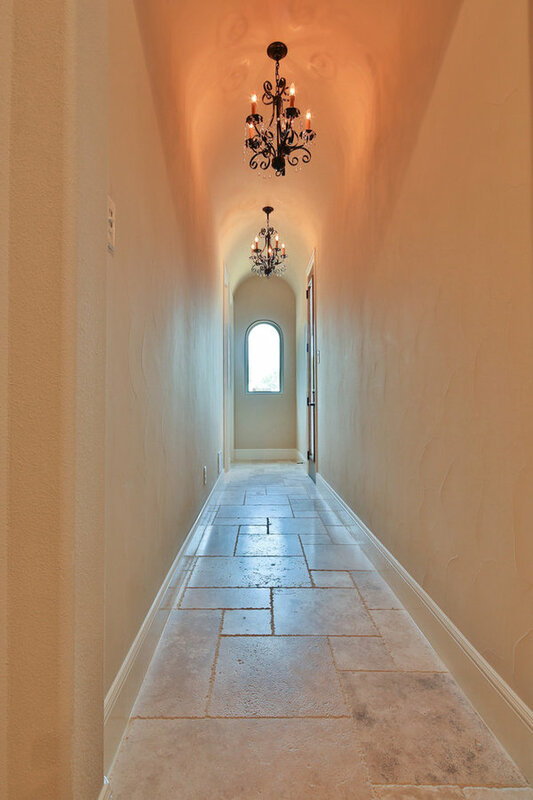 Hallway leading to downstairs bedroom with barrel vaulted ceiling, iron light fixtures, and a chiseled edge travertine tile floor. 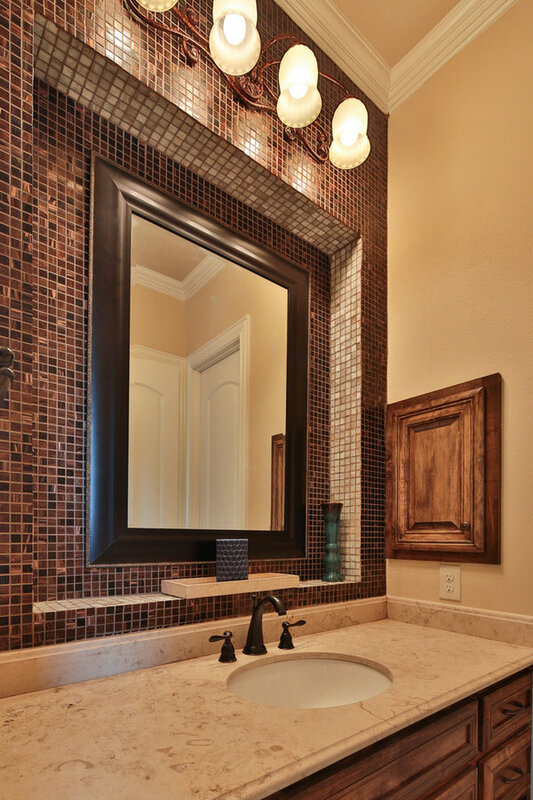 Downstairs bathroom with granite counter tops and tile detail around mirror. 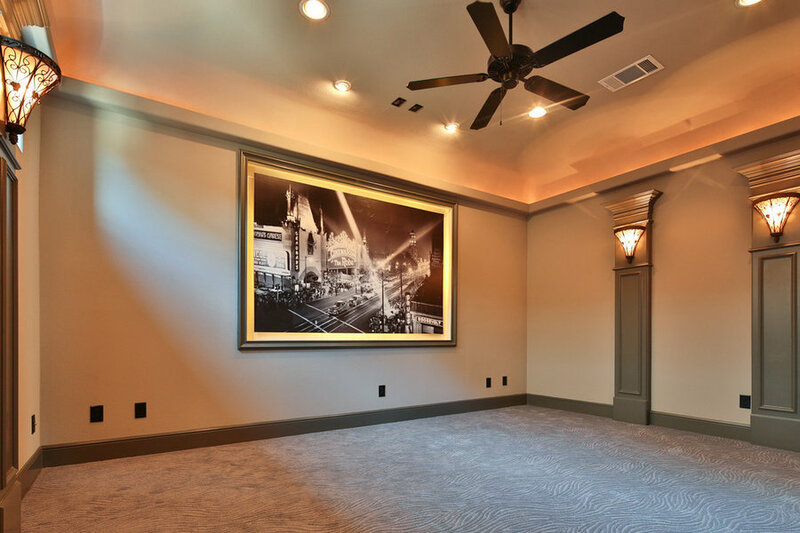 Fantastic downstairs media just off the kitchen with designer carpet, cove ceiling, pilaster wall detail, and a Hollywood picture mural. 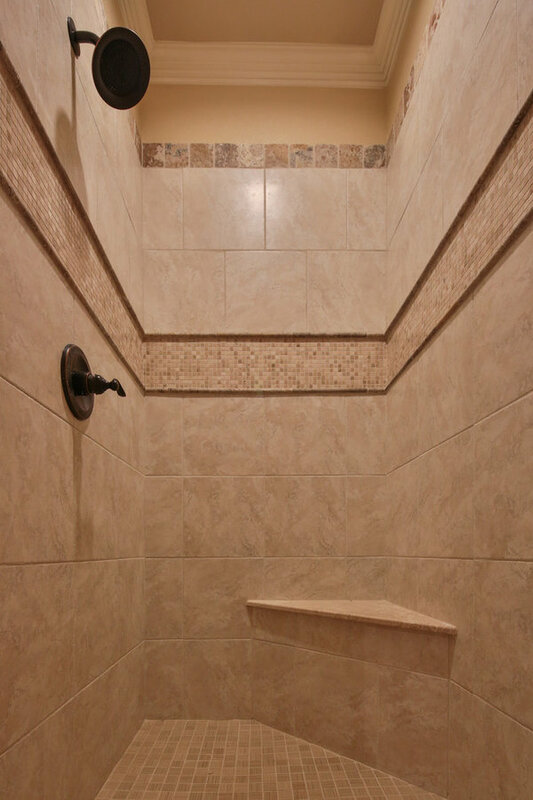 Detail of upstairs walk-in shower with tile detail and a resting bench.